Effient (generic name Prasugrel Hydrochloride) is an antiplatelet medication that will reduce the chances of a patient suffering a cardiac event (ex. Heart attacks, strokes), following the placement of a stent. A stent is used to widen the arteries of patients who have narrowed arteries due to plaque (cholesterol) buildup. Effient is used in combination with aspirin (ASA) to produce its effects. What are the potential side effects of Effient? Effient works by decreasing the amount of time for the blood to clot. Therefore the most common side effects will be bleeding related side effects such as nose bleeds, increased bruising and an increase in the time that it takes for bleeding to stop. Another more infrequent side effect may be nausea, usually only occuring when Effient treatment is first started. What is the relationshipe with Effient and bleeding? The most common serious side effect of Effient will be the occurrence of bleeding, the incidence of this occuring is listed below. This potential increased risk of bleeding is the consequence of taking any antiplatelet medication, as well as the consequence of taking antiplatelet medications in combination with Aspirin. As a general precaution, a patient should REPORT IMMEDIATELY to his/her primary care physician any incidence of unexplained bleeding. This may include increased blood in the stool (darkened tarry colored stools), increased bruising that will continue to get larger, as well as coughing or vomiting spurts of blood, pink or brown urine, and any bleeding that does not stop. How do I take Effient? Effient is supplied as a 10mg tablet to be taken once daily, this medication may be taken at any time of the day and may be taken with or without food. Initially when starting Effient, the physician may start a onetime initial dosage of 60mg (6 tablets) to initiate more rapidly the antiplatelet effect of Effient. Effient is taken along with Aspirin (dosage of 81-325mg). 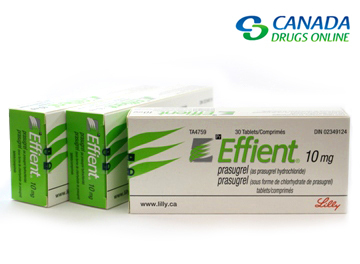 Effient is an effective medication and has been shown to reduce the incidence of cardiac events in stent patients. However, Effient is not for everyone. Below, is a list of patients who should not take Effient and a list of patients who should be monitored more closely when taking Effient. Who should NOT TAKE Effient? 1. Patients greater than 75 years of age. Due to the increased risk of bleeding, this age group is deemed unacceptable for Effient treatment. 2. Patients with a weight of less than 60kg (132 pounds). Patients in this weight range are at an increased risk of bleeding. Who should take Effient WITH PRECAUTION? 1. Any patient with a propensity to bleed. These patients should be thoroughly counselled on monitoring for bleeding side effects and what to do if bleeding occurs. Such patients include the following. 2. Patients concurrently taking medications that may increase the risk of bleeding. 1. Do not stop taking Effient without consulting your primary care physician. This may lead to an increased risk of cardiac events. 2. Consult your primary care physician immediately if you develop yellowing of the skin or eyes, fever, weakness, or if your skin becomes pale or dotted with purple spots. This may be an indication of a rare serious side effect called TTP.